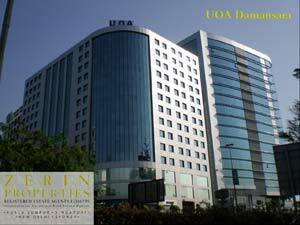 UOA Damansara 2 is a Grade A office building located on Jalan Dungun, Damansara Heights. It fronts Jalan Semantan and is easily accessible from KL and PJ. Featuring a double volume lobby with banking and F&B space on each wing and an extensive use of metal cladding and glass, it gives the building a modern look. Perfect for businesses looking to improve their corporate image. It is a designated MSC status building.